Arsenal boss Arsene Wenger has admitted that he is enjoying the current form of midfielder Aaron Ramsey. It is said that the French tactician hopes that the Wales international will continue to relish his role at the heartbeat of the side. 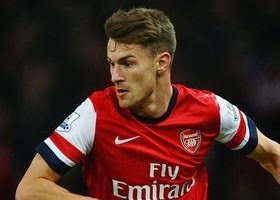 Wenger told Arsenal Player : “Aaron [Ramsey] has first a fantastic engine. I believe his defensive awareness has improved, his defensive qualities have improved and his defensive score is very strong now,”. “After that he has a huge desire to play every single ball. He wins the 50:50s – that was not the case a year ago. “If you let him, he takes the ball at the back, passes to himself in midfield and passes to himself up front because he wants the ball so much.